I’ve been having a lot of discussions with my daughter about sunsets these days. She’s fascinated by the colors in the sky and loves to guess what colors will appear as the sun dips below the horizon. 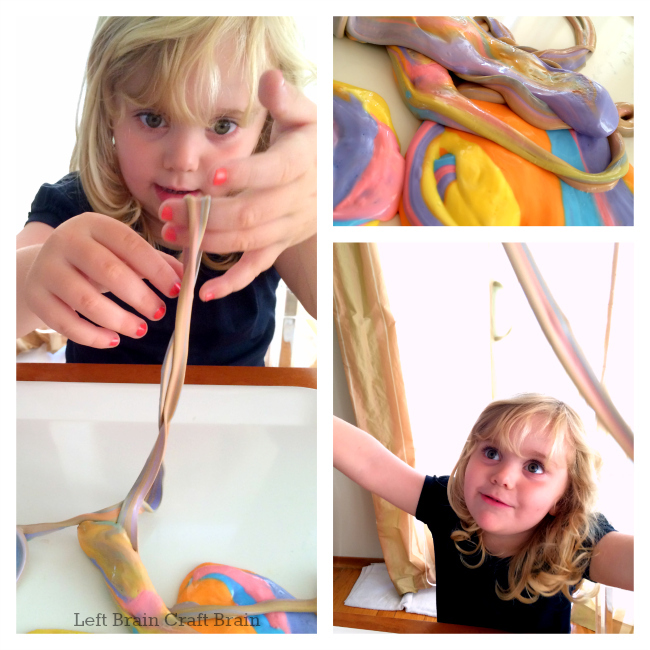 I figured this was a perfect occasion to do some learning through art, and Sunset Slime was born. 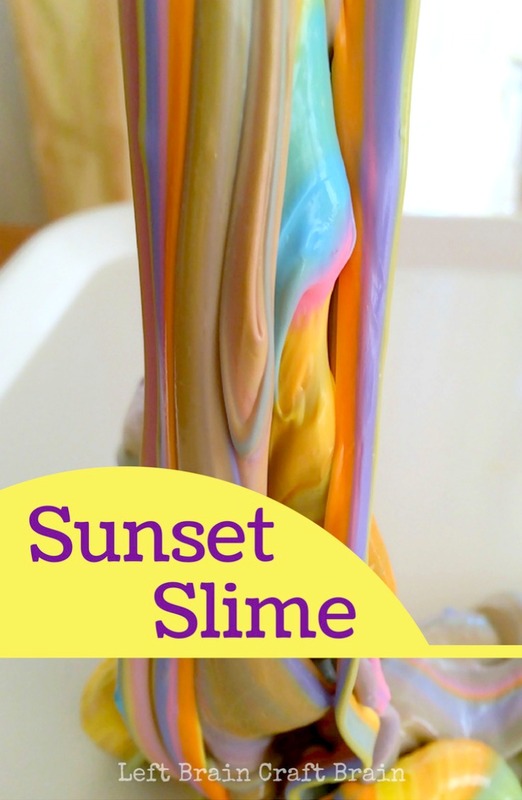 We made some small batches of slime and tinted them the colors of the most beautiful sunsets we’ve seen. Pink and purple, mixed with blue and orange and yellow. And then let the sunset mixing fun begin! Left Brain Craft Brain supply budget. Thanks for helping me keep the projects coming! 1. Gather five small containers or bowls (one for each color). Add 1/4 cup glue to each bowl. 2. Add one color of food coloring or liquid watercolors to each bowl to desired intensity. We chose purple, pink, orange, yellow and blue to mimic the colors of the sky at sunset. Mix well. 3. Pour 1/4 cup liquid starch into each bowl and mix until thick and slimy. Then knead the slime with your hands and return to the starch mixture for another mixing. This step is important because it makes sure there’s no unmixed glue hiding in the center of your slime ball. 4. Slime too slimy? Rinse it with water (do not pat dry with paper towels like I did!!!). Slime too sticky? Mix it with some more starch. 5. 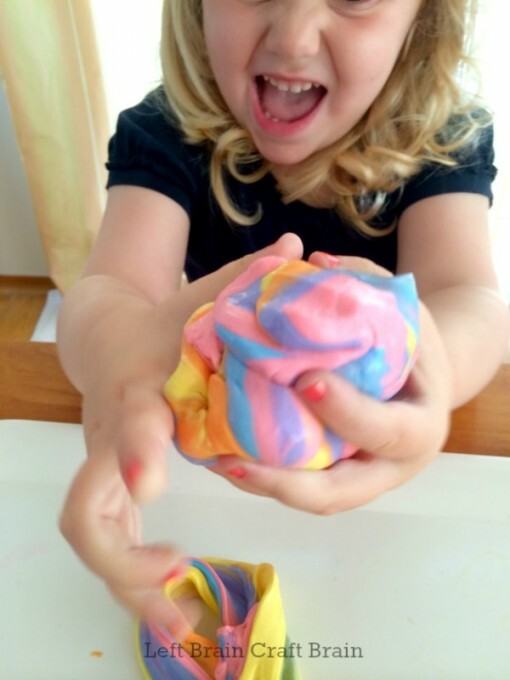 Store the slime in an airtight container or zipper bag for 1-2 months. To make the sunset, start rolling and stretching the colors and experiment with how the colors combine. The more you mix, the more subdued they get just like how a sunset fades into night. Why Does the Sky Change Color at Sunset? The gorgeous colors in the sky are due to a phenomenon called scattering. As light rays hit air molecules and particles in the atmosphere, the light separates into different wavelengths, each appearing as a different color to the human eye. During the day, the shorter wavelength blue and violet light dominates, but at sunrise and sunset the distance the sunlight travels is also a factor. At sunset, the sun is low in the sky, requiring the light to pass through more air as it travels to your eyes. The shorter wavelength blue and violet light scatters first, leaving the reds, oranges and yellows behind. Essentially, more air means more molecules, means more scattering, means more colors, means that stunning sunset… For another artistic way to learn about light defraction, check out my Prism Play and Chalk Art post. Need more slime? Or color? Or science exploration? 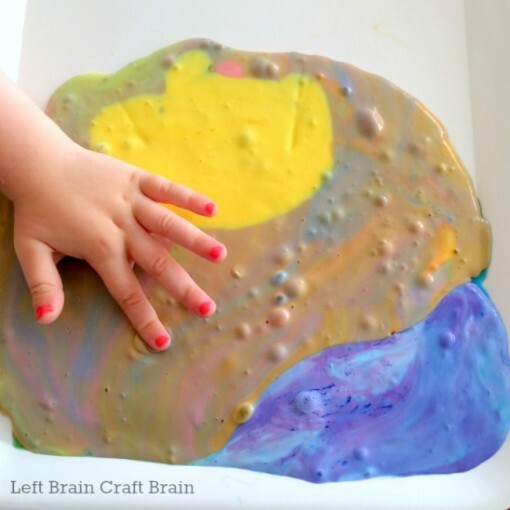 Follow Left Brain Craft Brain on Pinterest! This is such a great idea! I’m pinning to my Sensory Activities board and trying to figure out when we can do this at my house. Thank you! Thanks so much Jennifer! So glad that this is something you want to do at home. We had a lot of fun making it.